Myko Tech’s melanin has been found to be provide substantial protection to gamma radiation in mice models. See publication by Kunwar A et al. 2012. Myko Tech has developed a process to produce broad-spectrum antiviral polysaccharides from a marine microalga. Myko Tech has achieved high levels of in vitro synthesis of L-dihydroxyphenylalanine using extracellular tyrosinase using a process for which a patent has been filed. L-DOPA is a drug used for Parkinson’s disease. MykoTech's team has discovered several fungi new to science from the Western Ghats forests of India. These findings have been reported in two papers published in the International Journal Mycotaxon (see Publications). Such fungi are potential sources of novel metabolites. 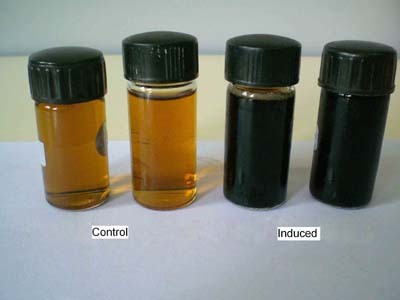 A process for production of water soluble melanin using a strain of the fungus Gliocephalotrichum simplex”. A process for the production of antiviral polysaccharides from Labyrinthulomycetes." Biotransformation of biologically active compounds from medicinal plants." Extracellular polysaccharides from Labyrinthulomycetes with broad-spectrum antiviral activities. 1. Kunwar A, B. Adhikary, S. Jayakumar, A. Barik, S. Chattopadhyay, S. Raghukumar and K.I. Priyadarsini. 2012. Melanin, a promising radioprotector: Mechanisms of actions in a mice model. Toxicology and Applied Pharmacology 264: 202-211. 2. Pratibha, J., Bhat, D.J. and Raghukumar, S. 2011. Four anamorphic fungi (with two new species) from forests of Western Ghats, India. Mycotaxon 117: 269-278. 3. Pratibha J., P. Bodke, S. Wahidullahb and S. Raghukumar. 2011. The fungus Gliocephalotrichum simplex as a source of abundant, extracellular melanin for biotechnological applications. World Journal of Microbiology and Biotechnology 28: 505-512. 5. Raghukumar S. and V. Damare. 2011. Increasing evidence for the important role of Labyrinthulomycetes in marine ecosystems. Botanica Marina 54: 3-11. 6. Pratibha J., S. Raghukumar and D.J. Bhat. 2010. New species of Dendryphiopsis and Stauriella from Goa, India. Mycotaxon 113: 297-313. 7. Pratibha J. S. Raghukumar and DJ Bhat 2009. New species of Digitoramispora and Spondylocladiopsis from the forests of Western Ghats, India. Mycotaxon 107:383-390. 8. Raghukumar, S. 2006. Marine eukaryote diversity, with particular reference to fungi: lessons learnt from prokaryotes. Indian Journal of Marine Sciences 35:388-398. 1. Enhanced production of extra-cellular melanin from various fungal sources for protection against UV and gamma radiations: Supported by the Department of Biotechnology, Government of India under its ‘Biotechnology Industry Partnership Programme”.